Founded in Bermuda in 1993, RenaissanceRe has offices around the globe and is one of the world’s largest and most successful catastrophe reinsurers. 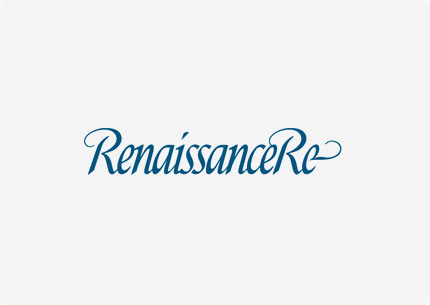 RenaissanceRe is also a leading provider of casualty and specialty reinsurance across a wide range of products. We participate selectively in the insurance market through RenaissanceRe Syndicate 1458 at Lloyd’s. In addition, we create and manage joint ventures and structured products that enable others to partner with and invest alongside us. Our largest joint ventures include DaVinci Reinsurance Ltd. and Top Layer Reinsurance Ltd.
Our management expertise, disciplined underwriting approach, sophisticated risk models and responsive client service have earned us a reputation for excellence throughout our industry. This success has also led us to achieve a consistent record of exceptional financial performance for RenaissanceRe’s shareholders. Reproduced with the permission of RenaissanceRe ©RenaissanceRe Holdings Ltd. All Rights Reserved.